Hoke will be paid $2 million this year and his base salary will increase by $100,000 each season. Hoke will earn a $1.5 million "stay bonus" after his third year and another $1.5 million "stay bonus" if he is still leading college football's winningest program in the sixth season of his contract. 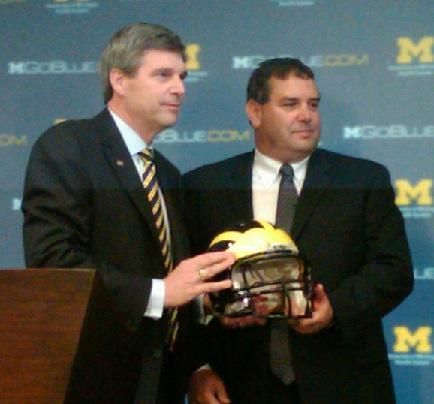 The Associated Press also quoted U of M Athletic Director Dave Brandon expressing confidence in Hoke. "It's a big job with a lot of expectations and we feel very good about how much we're compensating him to help us reach those expectations." Brady Hoke replaced Rich Rodriguez who lost the Wolverine head coaching job after three lackluster seasons and an NCAA investigation. Hoke was an assistant coach under Lloyd Carr before becoming a successful head coach at Ball State and San Diego State University. The contract was handled by my agent and the University. My focus has been on the football program and will continue to be on making this program the best in America. I couldn’t tell you what’s in the contract other than my signature. The University offered Laura and I an opportunity to coach at Michigan and that’s been my dream. Nothing will change my focus. 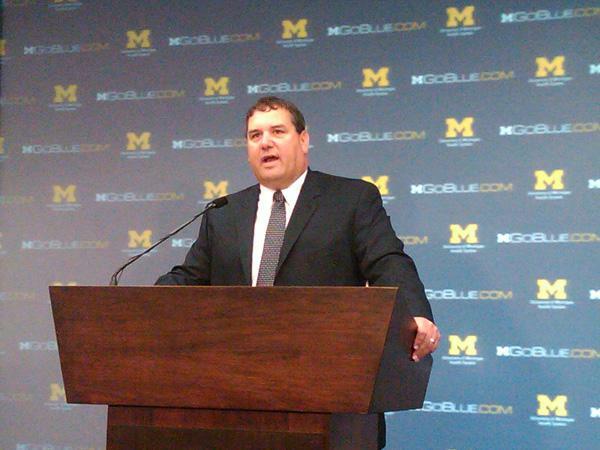 The University of Michigan's athletic department held a press conference to introduce the program's new head football coach, Brady Hoke. David Brandon says he spent a lot of time in the past few days crisscrossing the country interviewing coaches. He said he spent hours interviewing coaches saying despite what is often reported in the press, "all that glitters is not gold." Brandon introduced Hoke saying he's "a player's coach" and said he's someone who knows Ann Arbor and someone who loves the University of Michigan.